As other actors involved in the Libyan conflict have appeared to dither and issue mixed messages, the ICC’s Prosecutor has been remarkably decisive and concrete with his work. Within three months of having had the situation in Libya referred to the ICC, the Prosecutor has requested arrest warrants of the Tripoli Three – Gaddafi, his son Saif al-Islam Gaddafi, and the head of Libya’s Intelligence. Issues of time and timing go to the heart of the debates about the appropriateness of international criminal justice and the ICC’s work in particular. On a fundamental level, transitional justice is about time. Decisions about whether and how to confront past atrocities are about negotiating the past, the present and the future. Differing choices prescribe differing timing. Granting amnesties to those responsible for past atrocities suggest that the past should never be confronted; the past is better left in the past. Truth Commissions are a long and arduous process intended to establish narratives of particular time periods. Trials are meant to bring a sense of justice to victims immediately. Much of the debate regarding the relationship between peace and justice revolves around questions of timing. Those who voice the popular criticism that prosecutions provide incentives to leaders to entrench power and “fight to the death” believe that a political peace must first be established and only then should justice be pursued. The human rights community that says that trials are a moral necessity and the right of all victims argues that there is “no peace without justice” and justice must be pursued immediately after violations of rights have occurred. At the heart of these competing views are assumptions about when accountability should be pursued. The result is a debate about the relationship between peace and justice where one side argues that justice must be sought immediately, regardless of the political landscape of a conflict or even if a conflict is ongoing, and the other side argues that justice must be a secondary goal to the cessation of violence and the establishment of order. 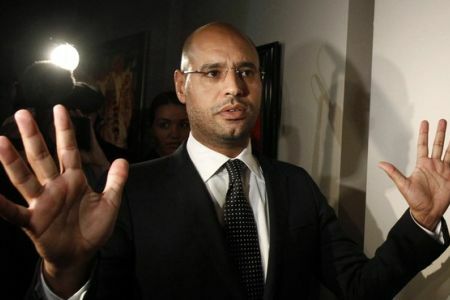 Saif Gaddafi, one of the Tripoli Three, is under investigation by the ICC. Less than three months since the investigation began, the ICC Prosecutor has requested arrest warrants. Much of what has been said about the ICC’s judicial intervention into Libya can be understood within this debate. And the common denominator of virtually all supportive and critical arguments regarding the ICC’s role are contradictory claims about the time and timing of pursuing international criminal justice. In this context, one of the most remarkable features of the ICC’s involvement in Libya has been how quickly the Court’s Prosecutor has investigated crimes and requested arrest warrants for the Tripoli Three. 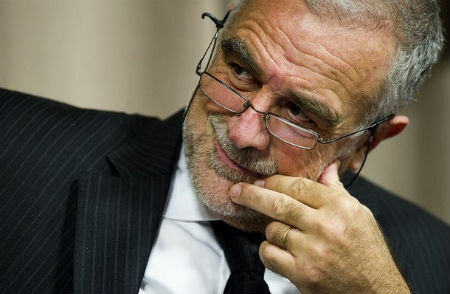 The amount of time that Prosecutor Luis-Moreno Ocampo has taken before issuing his request is unprecedented. Libya was referred to the ICC by the UN Security Council on February 26, 2011. On March 3, the Prosecutor declared he was opening an official investigation into possible war crimes and crimes against humanity in Libya. This past week, on May 16th, the Prosecutor announced he was seeking an arrest warrant for the Tripoli Three. In about two and a half months, the case went from being referred to the ICC to having the Prosecutor request arrest warrants. The speed of the Court’s work is only more impressive in relation to past investigations. Let’s consider two previous decisions of the Court to open investigations and subsequently request arrest warrants. On January 29, 2004, the situation in Northern Uganda was referred to the ICC by the Ugandan government. Six months later, on July 29, the ICC opened an investigation. It then took the Office of the Prosecutor (OTP) until May 6, 2005 to issue a request for arrest warrants. In total, the process took almost one and a half years. In the case of Darfur, the UN Security Council referred the situation to the ICC on March 31, 2005. Just over two months later, on June 6, the OTP opened an investigation. The first requests for arrest warrants, for two individuals involved in the Darfur crisis, came on February 27, 2007. 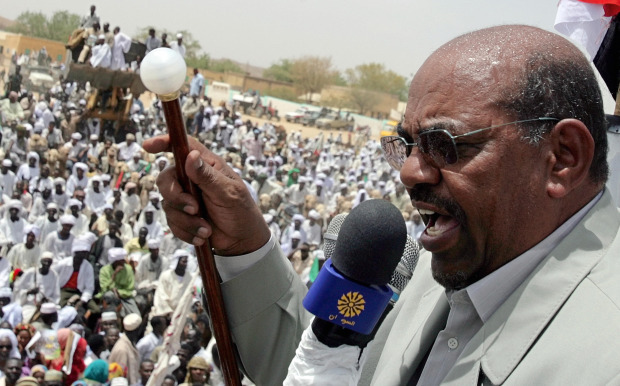 The arrest warrant for Sudan’s President, Omar al-Bashir, took longer. It was requested on July 14 2008 (note: a second arrest warrant for al-Bashir was subsequently issued on July 12 2010). In total, the process that lead to the request of the first set of arrest warrants took just under two years while the request for an arrest warrant issued for al-Bashir took well over three years. So what explains the zeal and speed with which the OTP has proceeded in requesting arrest warrants for the Tripoli Three? There are a few possible explanations. Maybe the work of the Prosecutor is like good wine: it gets better with time. How particular practices shape future practice in international law is largely unexplored. In this context, the difficult cases of Darfur, Uganda, Kenya, etc. that the OTP has investigated may have made the OTP more adept and efficient at working through evidence and speeding up arrest warrant requests. It may also be that the OTP is sensitive to one of the most salient criticism laid against it (and other Courts): that the drawn-out, sometimes painfully slow and incredibly costly nature of its work is a denial of justice. Trial justice can be an arduously lengthy process. Victims often do not live to see the day when justice is served. Some alleged perpetrators, like Slobodan Milosevic, die before a verdict is reached, denying the apportionment of guilt and the achievement of justice. Delaying justice, it is argued, is denying justice. As I have written before (in the context of ICC outreach in Kenya), the ICC has shown a capacity to learn as it matures. In this case, it may be learning that it must be quicker to act if it wants to demonstrate it has teeth and can use them too. 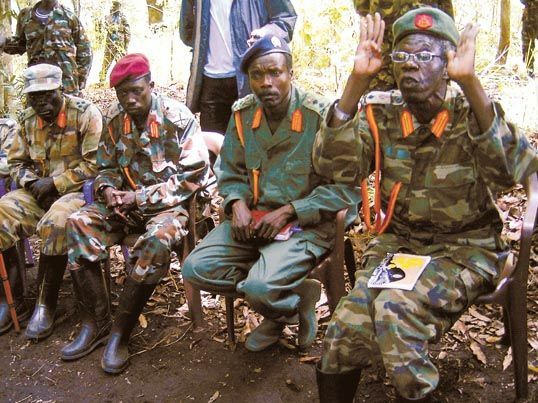 Joseph Kony (second from right) and Vincent Otti (far right) are both wanted by the ICC. The request for arrest warrants against them took almost one and a half years. In an earlier post I argued that the timing of the OTP’s work was likely to be, at least in part, politically motivated. There are context-specific issues facing the ICC’s work in the case of Libya. It may be that the OTP has been this expedient with its work as the result of a desire to have the Court issue an arrest warrant against Gaddafi before he goes into exile. Another reason for the speed may be the increasing recognition that Gaddafi may be killed by a targeted strike by coalition forces. It serves the interests of the Court to get an arrest warrant before Gaddafi is killed. If he were to die, the investigation into the Libyan leader would stop immediately. There is also an argument that issuing an arrest warrant as quickly as possible serves the interests of justice. Having an arrest warrant levied against Gaddafi – even if he is subsequently killed – will be a symbol that he was an individual sought by the international community to defend his acts. None of the above can fully explain the accelerated work of the OTP but it’s worth thinking about the questions of time and timing in the pursuit of international criminal justice. If you’ll excuse the pun, it’s about time. This entry was posted in Amnesty, Darfur, International Criminal Court (ICC), Libya, Libya and the ICC, Lord's Resistance Army (LRA), Serbia, Slobodan Milosevic, Sudan, Truth Commission, Uganda. Bookmark the permalink. Thanks Mathias – I saw this linked by David Bosco at FP but hadn’t had a chance to read it. Very interesting and I appreciate you highlighting it. ICC Judge Adrian Fulford stated at the last ASP in New York that he thinks the singular biggest challenge to the ICC is the length of the trials themselves- requirements for all judges to be present during proceedings and such. He had some interesting suggestions for speeding things up in the trial phase- have some notes on those points somewhere if you’re interested. CICC was going to see how they could keep the conversation moving and get states to take some action. I think we’ll hear more of this down the road. Thanks for the comment Hannah. I would definitely be interested in knowing some of Judge Fulford’s ideas about how to speed up trials. It will be interesting to see how states shape policies in this regard and whether any creative proposals can be put forward at a meeting of the ASP. Is not having all presiding judges present all the time a suggestion? That may actually make some sense as long as they were then required to watch all proceedings. Perhaps there could be a rule which stated that while it is ideal to have all three judges preside at any given time and everything will be done to ensure this is the case, under certain circumstances (family emergencies, due vacation, sickness, etc.) only two judges of three are required to preside over proceedings.